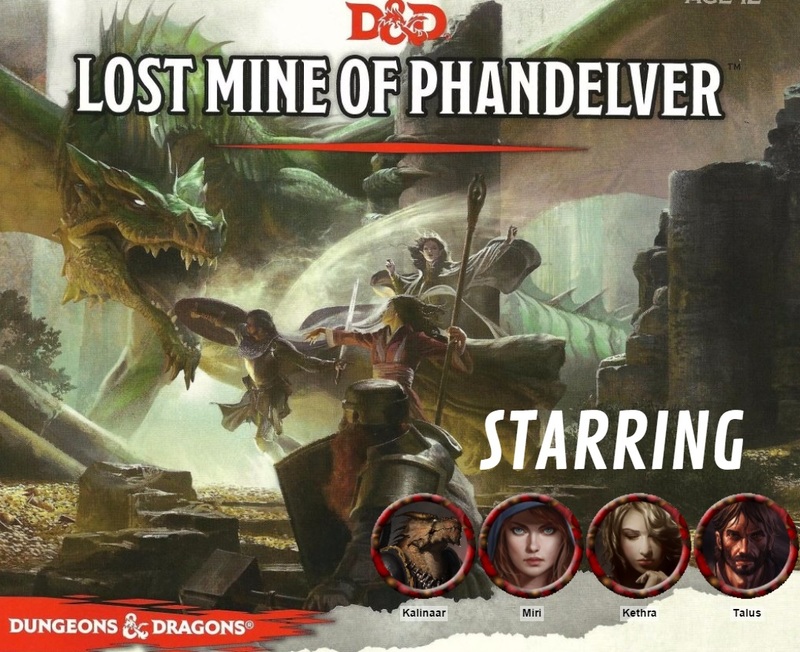 Everyone traveled to Phandlin in the hopes to find Cragmaw Castle (and also to rest off some grievous wounds). They turned in the supply wagon to Barthen’s Provisions and heard about the town’s woes with a group of mercenaries called the Redbrands. The PCs received some general goings-on in the town, then agreed to make their way to the Inn for more information and a hot meal. 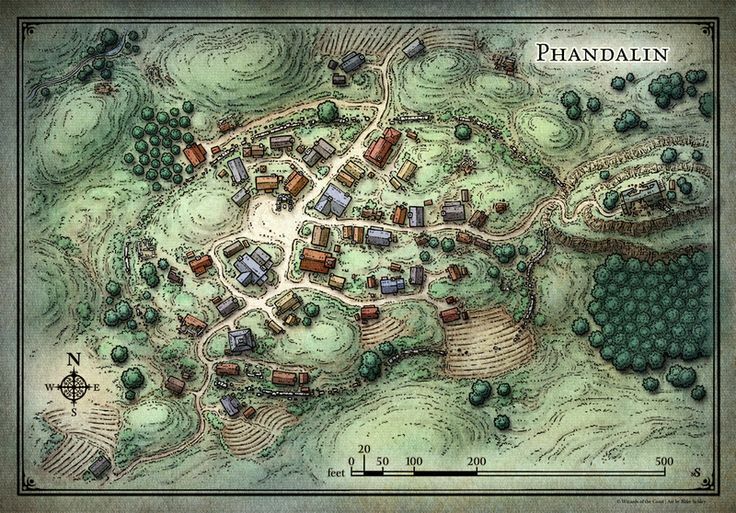 Since we use the visual aids of Roll20, I used a player map of Phandalin as if it were a dungeon – the picture minus the annotations. I then described the town and the major places of note that the players could travel to. I’ve learned from Shadowrun that my players very much appreciate direction and some nudging. I hesitate to compare my DMing style as video game-like, but I pretty much planted yellow exclamation points over the major NPCs that could give quests or impart important information. I think it worked really well and my players enjoyed having a bevy of options to explore without being overwhelmed with wandering around. At the inn the players learned more of the Redbrand threat. Ever-lawful Kalinaar vowed to bring the ruffians to justice if indeed they’d been extorting and terrorizing the populace. They heard more rumors of the Redbrands’ evil, including a murder of the town’s woodcarver, and of a band of orc raiders causing headaches to the East along the Triboar Trail. Finally the PCs turned in and leveled up to 2. I’m very glad that the first two levels come fairly swiftly in Fifth Edition – squishy PCs make me nervous! The next day the PCs spoke with Sister Garaele, an elf acolyte for Tymora at the town’s only shrine. They received their first side quest – to parley with the banshee Agatha near Conyberry to the East, and ask her a single question. There was a funny bit of role-playing where Kalinaar rolled so poorly on Investigation on Harpers and banshees that he was basically lost in the entire conversation. Next came the Townmaster’s hall, where Sildar had left a note to come speak to him there. The very grateful Sildar awarded them 50gp for saving him and bringing him to Phandalin, then offered the PCs another two quests – to investigate the disappearance of a human wizard named Iarno Albrek, and to not only find Cragmaw Castle but to drive out every last Cragmaw and rid the area of its goblin problem. The PCs like Sildar and they agreed to the tasks (finding Cragmaw Castle is basically the main quest anyway). They did not like Harbin Wester, the townmaster. I voiced him like a more redneck, annoying version of Lotso from Toy Story 3, with a gratingly long southern drawl, and phony-nice attitude. He gave the PCs the quest to rid the area of Orcs to the East in a mountainous region called Wyvern Tor. We had a lot of fun ribbing back and forth as the PCs clearly hated him and the Redbrand threat that he waved off as inconsequential. We were nearing the end of the session and I decided to run the Redbrand encounter when the PCs existed the Townmaster’s Hall. A group of four ruffians stopped the PCs in the street and tried to take them out before they could cause any trouble. The PCs didn’t seem interested in any verbal sparring, so we started combat and once again I failed miserably at initiative! This was our first encounter as level 2 PCs, and though they had about twice the health, the enemies were likewise much stronger than the average goblin (health-wise at least, I believe their attack is actually the same). A critical attack on the wizard Talus was cause for some worry (as well as a badly rolled sleep spell that affected no one), but nobody ended up going down. In fact two ruffians went down due to the Massive Damage rules I employ from the Dungeon Master’s Guide. The final one tried to flee toward the East, but was cut down when he tried to run past Kethra the rogue. There’s still plenty of places to visit and quests to gain, but now the PCs have been directly assaulted and attacked by the Redbrands, and their threat in the town is undeniable. Kalinaar dragged the sole survivor that dropped unconscious (without dying) to the townmaster, and declared to the gathering crowd that the Redbrand’s days were numbered. 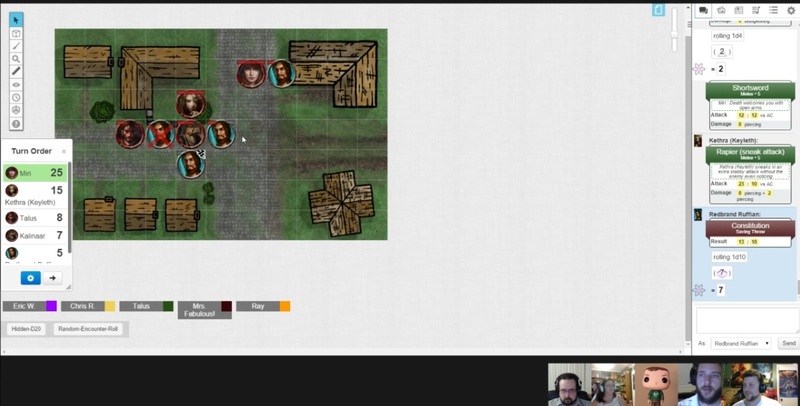 I’m really digging the way the PCs are handling the town and the Redbrands, and thus far Dungeons & Dragons Fifth Edition is working really well for our play style.